Invaders from foreign lands have generally not proved to be much of a problem for us British since the arrival of William the Conqueror more than 1,000 years ago. Himalyan balsam can quickly stifle other plants along riverbanks. We’ve managed to keep our shores free of would-be colonisers because we have this rather endearing habit of defending our island stubbornly. A couple of small corporals – one French and one German – have tried to muscle in on our green and pleasant land but both were eventually sent packing. However, we seem to be succumbing to a succession of rather more successful if somewhat more stealthy invasions – from water creatures and plants. I’ve written several times about the problem of Chinese Mitten Crabs which are working their way up the non-tidal Thames, drilling holes in unprotected banks and altering the river’s ecology pretty dramatically. Then there are American signal crayfish, which have also decided that the Thames is a des-res and are happily displacing the native British crayfish. These unpleasant little things – well, actually not that little – they grow up to six inches in length and have huge pincers – are genuine killing machines. 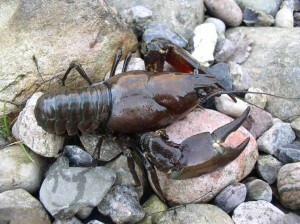 They will eat anything in their path including the native white-clawed British crayfish and, rather like the mitten crabs, they make their homes by burrowing into the mudbanks of the river where they can lay hundreds of eggs. There are already millions of these things in our rivers – they were originally introduced into the UK in the 1970s to be bred for the restaurant trade but inevitably some escaped and have colonised rivers across the whole country. Mink are another example – also introduced originally to be bred for their fur, again it only took a few to escape from their farms to create a real problem for the Thames where these sharp-toothed mammals prey on fish, ducklings and cygnets and occasionally bigger water fowl. And it’s not just animals that are proving a problem – plants too can create havoc on our riverbanks if they are not controlled. Japanese knotweed is one but another species, which is currently running amok beside the Thames is Himalayan balsam. Impatiens glandulifera, to give it its Latin name, was introduced into the UK in 1839 but as with many other non-native species, it has ruthlessly established itself and rapidly takes over any area where it is allowed to grow unchecked. You’d think that a relative of the humble Busy Lizzie wouldn’t create much of a problem but believe me it does. This rapidly growing perennial can reach up to 10 feet in height and during the summer it produces mainly purple flowers. But in the autumn, when the blooms have died away, it produces seed pods that burst explosively sending seeds shooting out up to seven metres away. They tolerate low light very well but they squeeze out other species and can quickly dominate the landscape. 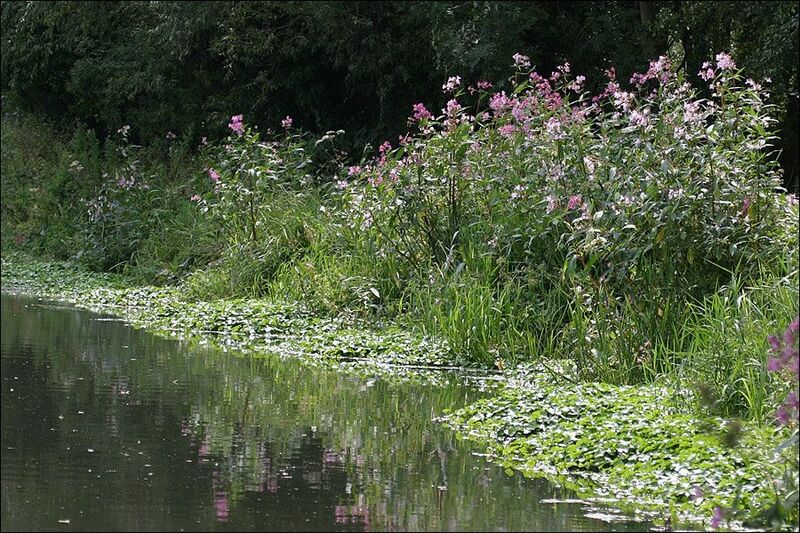 So I’d urge any of our readers who have a few hours to spare this coming week to get down to Desborough Island to help people from the Thames21 charity to try to get rid of Himalayan balsam plants that are threatening to take over the place. Thames21 will be holding two ‘balsam bash’ events on Thursday, July 25 from 6-8pm and then again on Saturday, July 27 from 10am to 1pm. All safety equipment will be provided and you just need to turn up at the bridge over to Desborough Island on either day with a willingness to get stuck in and remove these bothersome invaders.